How Streamlined is Your HR Complaint Process? The last thing any employer wants to deal with is an HR complaint. Not only does this mean a headache for your HR professionals, but the presence of an HR complaint means that the workplace environment has been disrupted and that something has happened to threaten a positive work climate. While HR complaints are unfortunate, expediting the complaint process is vital for maintaining a healthy work environment and enabling your employees to focus on the daily operations of your business. Is your HR complaint process efficient enough to quickly mitigate problems? Here are the sure indicators of a streamlined HR complaint process. HR complaints should never be approached with a “we’ll cross that bridge when we come to it” mentality. Your human resources strategies should include an explicit set of procedures for filing and investigating any and all HR complaints. An efficient system for managing HR complaints will ensure that employees are keenly aware of how to submit complaints from the moment they are hired. The wise employer will be sure to include the HR complaint process procedures in the onboarding process and as part of the employee handbook. Whether it is a complaint hotline to call, an online database, or an analog filing system, employees should be sufficiently informed of procedures for HR complaints. This mutual awareness between employers and employees increases the likelihood that complaints are filed soon after incidents. This can be tremendously beneficial for quickly addressing issues and may lessen their severity. Unreported issues can snowball into scandals and lead to larger issues that might have been avoided. An employee is unlikely to even file an HR complaint if they lack the confidence that it will be fairly addressed. This can lead to lingering issues that can develop into serious problems for your business. As previously mentioned, HR complaints are best resolved when filed immediately after incidents. To encourage immediate filing among your staff, it is important to foster a culture of compliance in your workplace. Be sure that your employees know that your business operates with integrity and that any behaviors that threaten this integrity will be promptly addressed. If the culture of your workplace doesn’t encourage and enforce compliance, check out this article for ways to focus your strategic human resources planning on building a compliance culture. Addressing a workplace complaint can be a messy process. Keeping personal connections out of the mitigation of an HR complaint may be difficult, especially in small businesses where all employees work in close proximity to one another. As much as your HR experts may try to be objective, certain situations may challenge those abilities if your human resources department operates in-house. In circumstances such as these, the most efficient HR complaint processes will involve an objective party. Outsourced HR for small businesses can be the key to ensuring that subjective feelings do not affect the way in which each situation is approached. This clarity and objectivity is essential for efficiently resolving complaints. 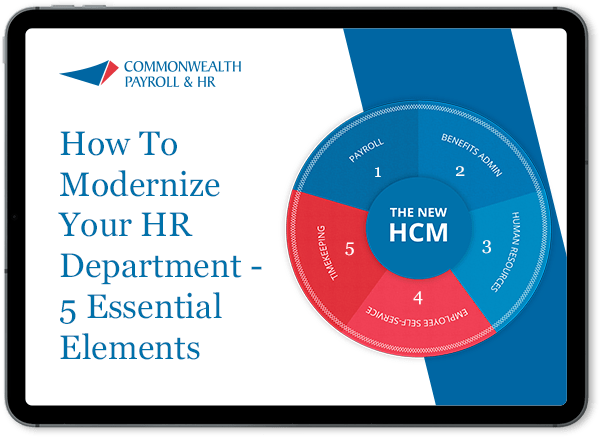 Outsourced services like those offered by the experienced HR professionals at Commonwealth Payroll & HR also provide systematic approaches for managing HR complaints, as well as a variety of other human resource matters. Outsourcing HR with Commonwealth provides you with an experienced professional who is no stranger to HR complaints. Whether you need your human resources fully managed or are just looking for some more basic support, Commonwealth’s HR services include HR data tracking to ensure proper maintenance of any pertinent information in order to streamline the HR complaint process. As an added benefit, our Managed HR Services also offer compliance tracking to help stop problems before they begin. Don’t run the risk of conducting your business with an inefficient HR complaint process. Set your small business on a trajectory for improvement today by contacting the experts at Commonwealth Payroll & HR. Call us today at (978) 599-1500.